Agapanthas also known as the African lily are easy to grow. They are summer-flowering perennial plants which do well in a well-drained, sunny position in the garden. They can also be grown in pots which makes them very versatile. In Cape Town they are used to decorate roadsides and anywhere green foliage is needed. The species we use in Cape Town is evergreen and has fleshy, rhizomatous rootstocks with thick leaves that look like grass. 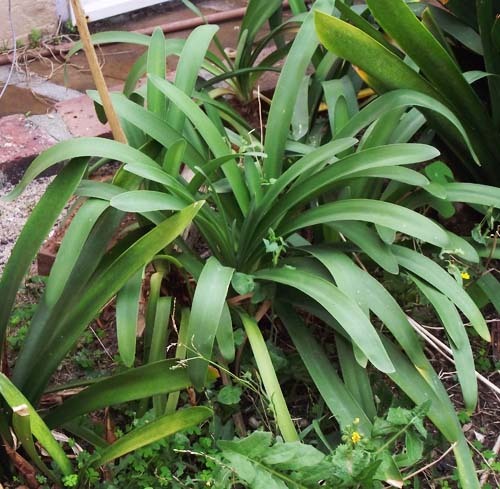 When planted on a hillside en masse the roots hold the soil together and when in flower turn the area white or blue depending on the colour of the agapantha you have planted. One is using seed produced from the flowers when they die down after flowering and the other way is to dig up a mature plant and split it into a number of pieces which after trimming off the roots by about two thirds of their length can be replanted. Soil needed to grow agapanthas. To be succesful with agapanthas you need a fertile well drained soil. To achieve this compost should be dug into the soil up to a depth of 5cm. As Agapanthus like full sun they should not be planted in the shade. Plants planted in the shade don't grow too well and could result in the plant either growing lush foliage and producing no flowers or not grow at all. Depending where your plants are coming from the following procedures should be followed. If you are breaking up a larger plant and planting the new plants directly into your garden you should trim the root system and the foliage so that are both about 15cm in length. The ideal distance to plant them apart is about 30cm. Agapanthas grow into large plants so depending what it is you want to do with them you could either plant them closer or further apart. If it is a show of flowers along a border you want then plant them closer together. Ie less than 30cm apart. If you want to produce clumps of them then plant them about 45cm apart. Once you have decided on all of the above dig a hole that is deep and big enough to place the plant that you have trimmed in so that all the roots are covered and the foliage is above the ground. Plants that you have purchased in pots should be removed and placed in a hole large enough to fit the plant so that just the foliage is above ground. If the plant is too big trim it back as explained above before planting..
Agapanthas can also be grown in pots. Use a pot which is about 25cm in diameter. The reason for the larger pot is that the plant will get bigger and you will need to change pots on a regular basis to accommodate its size. Another problem with a small pot is that you will have to trim the plant each time you transplant it and that is sure to affect the flowering of the plant. Clumps of plants should only be broken up every four to six years and this applies to plants growing in pots as well..
Procedure to follow when using pots. The pot you are going to use should have drainage holes in the bottom. As soil will run out of these holes when you water the plant you should place a layer of drainage chips in the bottom of the pot. Enough to cover the holes and to prevent the soil being washed out. On top of this you can place a layer of sand and on top of this the potting soil. The sand and chips should take up about a third of the space in the pot. Put a layer of potting soil on top of the sand and then place the plant into the pot and fill up around it with potting soil. Once you have done this water the plant to consolidate the soil around the roots. Leave some space at the top of the pot to enable you to water the plant in the future. Place the pot in a sunny spot. 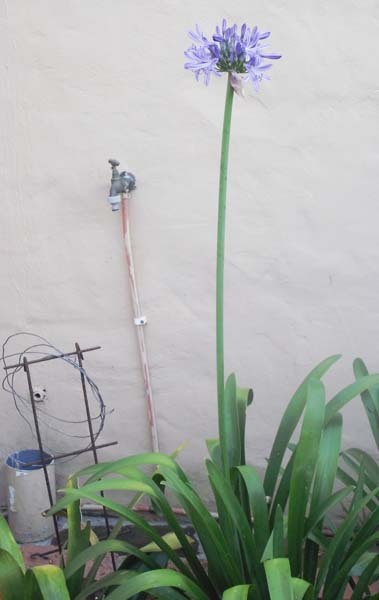 Agapanthus are drought-tolerant in the ground and in pots. They are also waterwise plants which means they don't have to be watered every day. They still need to be watered at least a couple of times a week throughout the summer. They don't require as much water during the winter months. Feed your agapanthas with a high-potash liquid feed once a week during summer months to promote good flower development. 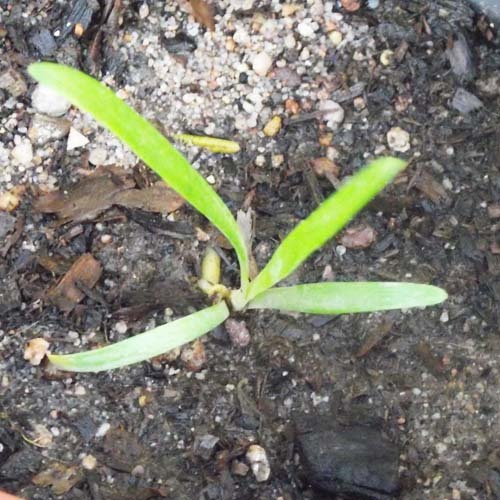 Agapantha seedling which is about six months old. Once agapanthas have stopped flowering the flower produces pods where the flower was. Wait until these pods start turning brown and cut them off and let them dry out properly. Do not place them in a sealed container as moisture will cause the seeds to rot. They should be kept in a dry place where moisture can evaporate. The pods will eventually split open and then you can collect the seeds . There are many ways to plant seeds but the method I use is a seed tray. Use an old beer tray or make yourself a tray out of wood. Fill the tray with potting soil and ensure that there are drainage holes so excess water can be drained off. Sprinkle your seeds over the potting soil and cover them with about a centimetre of potting soil. Water the tray and place in a sunny spot in your garden. Keep the soil wet and in a week or two you will see the seeds starting to germinate. Keep them in the seedling tray until they are about 3-4 centimetres tall and then transplant them into pots. When the plant's leaves are about 15cm long they should be ready to go into the ground. These seedlings grow slowly so don't expect them to flower straight away. It takes between to and three years before they flower.